Love love love these bagels. They’re homemade and the texture and taste is amazing. Hot out of the oven with a homemade spread, omigoodness nothing quite compares. Have to save the recipe onto this blog for my girls. It’s from a recipe app called Robogourmet and these will be frozen tonight ready for breakfasts or lunches during the week. They do take an hour and half to prove but worth the effort if you’re home for a couple hours. The initial dough prep takes less than 5 minutes. Place all ingredients in the Thermomix. Mix for 15 secs/speed 6. Then knead on dough mode for 2 mins. Place dough in warmed Thermoserver and leave to rise for about one hour or leave in TM bowl. Divide the dough into about 10 – 12 pieces ( approx 70g each ) and roll into balls. Use your thumbs to create a hole in the centre. Allow to rest on a lined baking tray for about 30 minutes. Cover with tea towel. Heat oven to 240C. Boil a jug of water and tip water into a thermoserver or pot. Helps to have two containers of boiling water so you can do three bagels in each container at once. 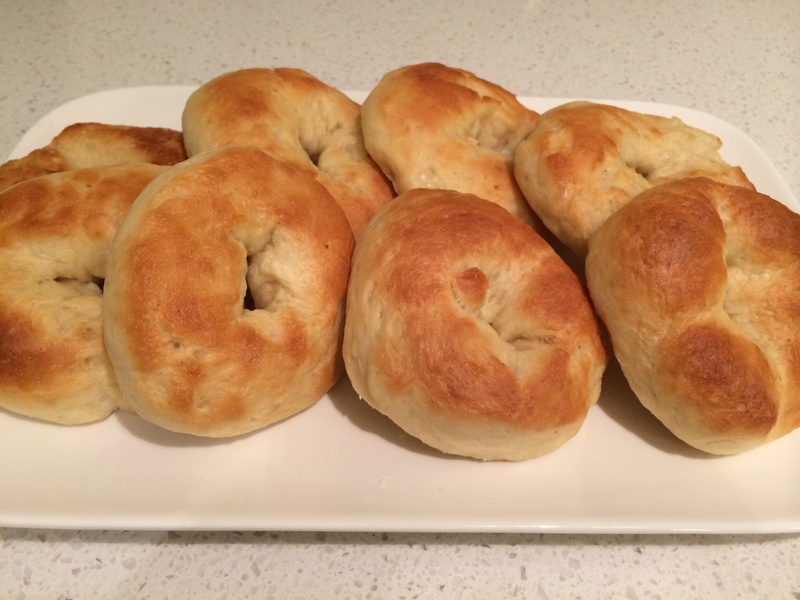 Drop three/ bagels into the boiling water for about 30 seconds per side. Use a slotted spoon to transfer to a rack to drain. Nb water must be close to boiling, if your water cools add more boiling water to increase temperature. Return to the baking tray and bake in the oven for 15 minutes or until lightly golden. Notes: Can brush with butter and coat with seeds before baking (eg Sesame/poppy/pumpkin) Bagels brown better if they’re not too soggy so just allow a few minutes to drain after the dipping process. Also can speed up the process by having two bowls of boiled water for dipping and Miss 14 to help drop the bagels into the water.